If you’re trying to improve movement during stroke rehabilitation, then these stroke recovery tools can help. We’ve listed our favorite gadgets and gizmos below, organized by muscle group. Therapy putty is a popular stroke recovery tool. 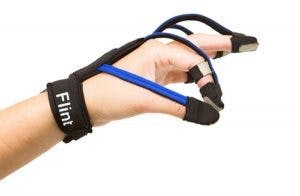 It’s affordable and portable, so you can take your hand therapy with you wherever you go. MusicGlove is our hand therapy device that’s clinically proven to improve hand function in 2 weeks. It’s more expensive than putty, but it helps you improve hand function much faster. Mirror therapy is a great way to improve hand movement when you have paralysis or severely impaired movement. It tricks your brain into thinking that you’re moving your affected hand (when you aren’t), which activates neuroplasticity and helps “wake up” your affected hand! Electrical stimulation (or TENS therapy) is a great way to boost movement improvement after stroke. The electrical stimulation helps boost neuroplasticity and rewire your brain. 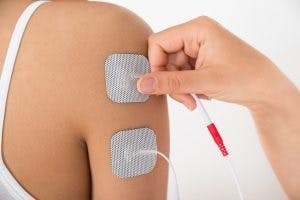 TENS therapy is only effective when you use it in conjunction with rehab exercise, so don’t forget that essential step! 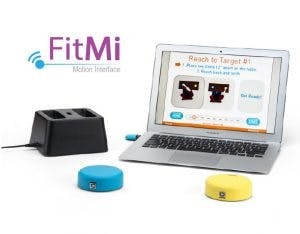 FitMi is our full-body home therapy device that helps get your whole body moving. Our customers have experienced rapid movement improvement with FitMi. One woman saw results in just 3 days, and another man was able to move his arm for the first time ever after just 3 weeks! Stability balls are a great tool for improving core strength after stroke. If you’re trying to improve balance, then strengthening your core is essential. Since many stroke survivors struggle with balance after stroke, you can improve safety by getting a base with your stability ball. Dumbbells are a simple tool for rebuilding upper extremity strength after stroke. Before you invest in a pair, you can start by using household items as light weights (like water bottles or soup cans) until you get strong enough to progress to heavier weights. 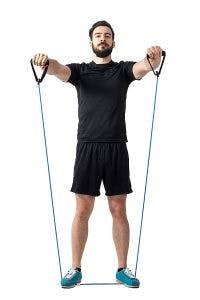 Resistance bands can be used for the full body, but they’re particularly useful for your arms and shoulders. Use them to do bicep curls, shoulder presses, and much more. Stationary bikes are a great option for bilateral training. If one leg is weaker than the other, the stronger leg can help support your affected leg. In time, your affected leg will get stronger and stronger as you rewire your brain. Which Stroke Recovery Tools Are Right for You? Does this help me achieve high repetition? Can I see myself using this consistently? Does this make me excited to do therapy? Repetition is important because it activates neuroplasticity, the mechanism that your brain uses to rewire itself. Rewiring your brain is how you will reconnect your mind to your muscles and improve movement. Consistency is important because that’s how you reinforce all the new connections that you’re forming in your brain. And excitement is important because, well, consistency is difficult without it. So what did you get the most excited about from this list? That’s the best stroke recovery tool for you!